A man caught with cocaine, a baton, and an imitation handgun, has been sentenced after officers spotted him driving through the City with a faulty brake light. A man caught with cocaine, a baton, and an imitation handgun has been sentenced after officers spotted him driving through the City with a faulty brake light. Peshang Sleman, 19, of Sparks Close, Dagenham, Essex, was sentenced at Inner London Crown Court on 29 November to three years’ imprisonment in a young offender institution. On 19 June, at 3.45pm, officers in Cheapside (EC2) noticed a silver Vauxhall Astra with the broken light. 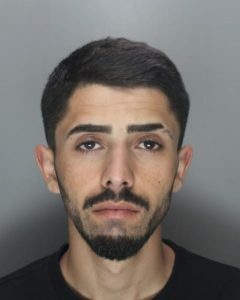 The driver identified himself as ‘Alex Domis’ from Romania, but officers became increasingly suspicious of his nervous manner and attempts to conceal his phone screen and ID. A search of the car involving a drugs dog uncovered 18 vials of white powder, later proven to be cocaine, hidden in a white sock under the driver’s seat, as well as a black extendable baton and a realistic-looking black imitation handgun. This later was established as a cigarette lighter designed to look like a Walther PPK pistol. 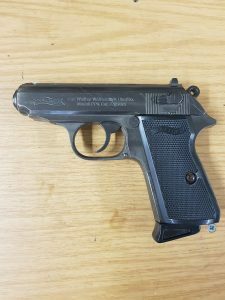 Sleman was arrested for possession of an offensive weapon, possession of an imitation firearm, possession of Class A drugs with intent to supply, obstruction of justice, and driving without insurance. His true identity was confirmed once in custody, and he also had two phones, and iPhone and a Nokia, and £170 cash seized. Upon interview, Sleman gave a prepared statement in which he claimed the drugs were for personal use only, the imitation firearm was a cigarette lighter, and the baton was a collector’s item he had bought online and did not realise was in his car. He gave no comment to several questions, and refused to give officers the pin number to his phone. Detective constable Ashleigh Wright of the City of London Police said: “The City of London Police operates a zero tolerance policy to drugs. To report crime to us call 101, report online or contact Crime Stoppers anonymously. Sleman pleaded guilty to possession of an offensive weapon on the first day of trial. He pleaded guilty at magistrates’ court to obstruction and driving offences. He was found guilty by a jury of possession of a Class A drug with intent to supply, and possession of an imitation firearm. He received 30 months’ imprisonment for possession with intent to supply Class A drugs, and a consecutive term of six months for possession of an imitation firearm, as well as four months for possession of an offensive weapon, concurrent. He received no separate penalty for the driving offences or obstruction, but was disqualified from driving for 25 months.